London-based artist Julie Cockburn transforms vintage photographs by embroidering across their surfaces, adding bright pops of thread to portraits that are either black and white or have faded over time. Using found images from eBay and flea markets, Cockburn obscures the faces of strangers, layering the portraits with multi-colored dots, geometric patterns, or ovals in varying gradients. 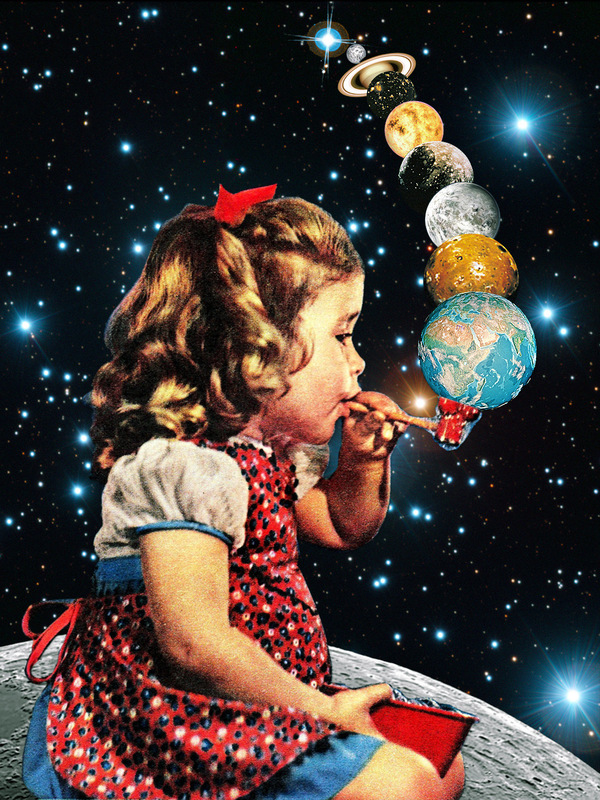 Collage artist Eugenia Loli uses photography scanned from vintage magazines and science publications to create bizarre visual narratives that borrow from aspects of pop art, dada, and traditional surrealism. Loli’s background is almost as diverse as the imagery she employs, having been born in Greece and living in Germany and the UK before settling in California. She previously worked as a nurse, a computer programmer, and as a technology journalist, but has only recently found a calling in collage work with publication in numerous magazines since 2013.